Calorie burn during a half-hour running workout will vary greatly depending on your body weight and your pace. If you want to increase your calorie burn during your run without increasing your exercise time, push yourself to run faster or add hills to your workout. A half-hour running workout will burn calories at a higher rate per minute than your normal average calorie burn rate because of the energy your muscles require while running . When you begin to run, your body recognizes that it can't keep up with the new energy demands and it starts making adjustments to convert stored fuel to energy. In order to generate this fuel, your cells require additional oxygen. You begin to breath harder and your heart pumps faster to deliver sufficient oxygen to your cells. As you convert stored fuel to usable energy, your body burns a greater number of calories. So, the harder you work, the more energy your body will have to produce and the more calories you burn. 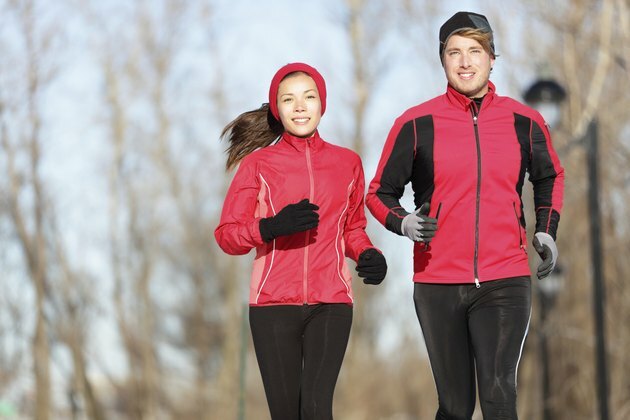 The number of calories burned per half-hour run will vary based primarily on your body weight and speed. A heavier person has to work harder to move their larger mass, so they will burn more calories. Similarly, a person who runs faster will burn more calories than a person who runs at a more leisurely pace. According to Harvard Medical School's calorie burn rate calculator, a 185-pound individual who runs for 30 minutes at a 5 mph pace will burn 355 calories. If that same individual picks up the pace and runs at a 7.5 mph pace for half an hour, he'll burn 555 calories. Similarly, if a 125-pound individual ran at the same two speeds, she would only burn 240 and 375 calories, respectively. If you want to increase your calorie burn, but you don't think you can increase your speed for the entire run, consider running hills or performing intervals. Running hills requires greater energy resources because you have to lift your body weight up an incline. And, a 2012 study published by the American Physiological Society demonstrated that, not only does alternating a period of high-intensity exercise with lower-intensity exercise during an interval workout boost your calorie-burning power, it gives you an afterburn calorie-deficit bonus. Test subjects burned an extra 200 calories over the day following interval training.